Rome is one of the most romantic cities in the whole world. There are many fountains in the city of Rome. 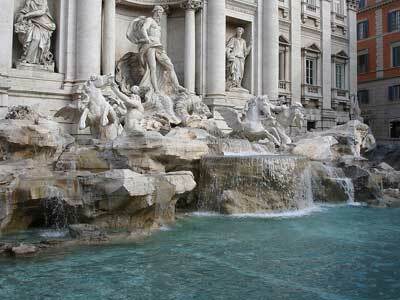 However, the most famous of those fountains is the Trevi Fountain. It was made in an artistic style, which was famous between 16th and 18th century. It is 85 feet high and 65 feet in width, making it the largest fountain of this type. When it was being made, people used to drink a glass of water from this fountain because they wanted to ensure that they would have a good fortune and a next quick trip to the city of Rome. Slowly this practice was taken over by the coins. There are many people who believe that throwing a coin into the fountain will make their quick return to the Rome city. All the visitors feel very excited when it comes to throwing a coin into the fountain as they really want to come back to the wonderful city of Rome. They want to visit this romantic city again and again. Today, the visitors do not stop at tossing a single coin. Instead many are known to toss several coins as they want to make sure that the legend of Trevi Fountain comes true for them. It is because of this reason that more than 3,000 euros are thrown into the fountain every day, and the fountain has become a reservoir of international coins. The coins tossed into the fountain are used for charity purposes to aid the poor of Rome. The other thing which makes it worth visiting the fountain is the architecture, statues and the water which flows from it. 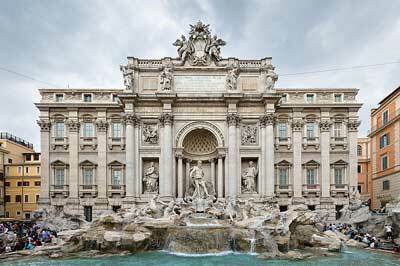 The Trevi Fountain is one the most popular fountains in the world. This fountain is situated in Rome, Italy. The credit for the design of the fountain goes to Nicola Salvi, who was commissioned by Pope Clement XII in 1732. It took 30 years to build the fountain, and it was finally completed in 1762. More..